Warning: This post contains spoilers for Assassin’s Creed: Revelations. I am a long time fan of the Assassin’s Creed series, particularly its atmosphere and attention to detail. However, Desmond, the series protagonist, has barely piqued my interest in the slightest. Sure, I enjoy the mysteries of the Assassin brotherhood in modern times, and the always fabulous voice acting from good ol’ Nolan North, but the blank slate hero does nothing for me. Ezio, on the other hand, is actually a compelling character. After three back-to-back games with the Italian assassin taking the lead, I am ready for Signore Auditore to go, but I also have enough interest in the story to make sure Ubisoft manages his departure well. 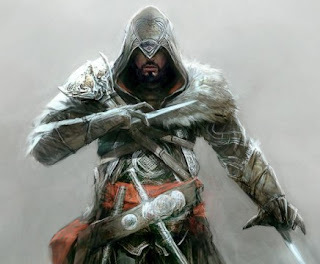 Altair, the lead from the first Assassin’s Creed, received plenty of criticisms as a character. He comes off as shallow and uninteresting, and the sub-par voice acting did him no favors. Ubisoft surely took this precedent to heart when fashioning Ezio. From the beginning, Ezio has a family, love interests, siblings, and generally maintains clear motivations to pursue his work throughout. He also grows as a character through his three entries into the franchise - a startling departure from industry norms, I know. By the end of Revelations, Ezio retires from the franchise, and the Assassin lifestyle, with honor. Ezio’s most interesting characteristic has been his understanding of the larger game narrative. He is not an unknowing avatar of Desmond. This fits very much into the series’ acknowledgement and inclusion of game tropes into the story. The user interface, the load screens, even player failure, all make sense within the narrative of the animus - Desmond’s, and by extension the player’s, entryway into the past. Assassin’s Creed manages to reveal the fourth wall without breaking it, wholly accepting “gamey” contrivances within the fiction of the world. Ezio plays his role within a larger narrative of which he is aware. When the apparitions of the first civilization reveal themselves to Desmond through Ezio, for just a moment the game becomes incredibly meta. The creators of hidden secrets, the “designers” of Desmond’s fate, reveal themselves to Desmond, the “player”, through the intermediary of Ezio, the “character”. Assassin’s Creed is a story of a videogame character who becomes self-aware, knowledgeable of a secondary existence outside their own, a piece within some stranger’s personal story. How does Ezio react? By continuing to fulfill his role. Ezio’s actions become more heroic when considering his relationship to Desmond/the player. It is rare to feel as though a character has agency outside the player without removing interactivity. Ezio, in a bizarre way, maintains a unique layer of self-awareness while also fitting naturally within the fiction of the Assassin’s Creed universe. At the end of Revelations, Ezio speaks directly to Desmond, aware that he is listening, and states “I am only a conduit for a message that eludes my understanding.” He recognizes his minimal role with a larger story that encompasses the entire series. As I sat on my couch, I heard Ezio speak, at least partially, to me. Setting the tools of his trade aside, Ezio departs the series not as an extension of my will, but as a compatriot on one leg of my journey as a player.